I have long been a fan of America’s Test Kitchen. I’ve spent many lazy Saturdays watching the show (and its sister show, Cook’s Country), which unlike most of what’s available on The Food Network these days, actually teaches you how to cook. There’s something soothing about it. It’s not flashy or particularly exciting. It’s sometimes (always?) dorky and hokey. It’s maybe even a little bit boring. And that’s what I like about it. Because, honestly, I could use some more boredom in my life these days. Exciting is overrated. Informative, well-researched, rigorously-tested, meticulous, and reliable is where it’s at. There’s no drama in their recipes, because you know, just know, that every single one of them is going to work. So when they reached out to see if I wanted to take their new cookbook, One-Pan Wonders, for a spin, I immediately said yes. This book is all about dinners that can be made in one pan: sheet pan, Dutch oven, skillet, roasting pan, casserole dish, or slow cooker. Efficient, simple meals that are easy to clean up. And I hate cleaning up. These recipes aren’t on the cutting edge of the food scene. That’s not their style. But they include a range of dishes from American standards like meatloaf and mac and cheese to Italian, Mexican, Vietnamese, Korean, and Spanish inflected dishes like these fideos with chickpeas, fennel, and kale. I was immediately drawn to it because it uses ingredients I cook with all the time but treats them in a slightly different way. Fideos is similar to paella, but instead of using rice, a thin vermicelli-like pasta gets broken up and toasted in olive oil and then cooked in a smoky tomato sauce. I love that instead of chorizo and seafood, this version goes vegetarian with loads of kale, slivers of fennel (a vegetable that’s underrated) and gets some heft from the chickpeas. It gets its smoky flavor from one of the spices I reach for most, smoked paprika and it gets some complexity from a generous splash of white wine. (And if you’re going to open the bottle you might as well have it with dinner…). They recommend topping the fideos with a squeeze of lemon and a drizzle of homemade garlic aioli, which is nice but really not necessary if you don’t want to bother. I could also imagine tossing in a few nubs of tangy goat cheese or nestling in some eggs to cook while this goes under the broiler. But without any of those extras, this dish is vegan. And it’s a welcome weeknight meal, with great depth of flavor and just one pan to wash at the end of the night. Fideos is like paella in pasta-form. Thin noodles get toasted in olive oil then simmered in a smoky tomato sauce that gets perked up with a splash of white wine. 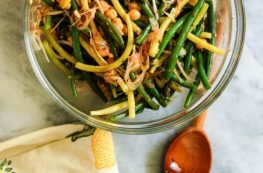 While it traditionally uses chorizo and seafood, this version is vegetarian with chickpeas, fennel, and kale. You'll need a broiler safe 12-inch skillet (or, even better in this case, a saute pan with straight sides) for this dish. The pan will be really full, so be careful when transferring it from the stovetop to the oven. The garlic aioli is optional, but nice. A squeeze of lemon is also a nice touch. 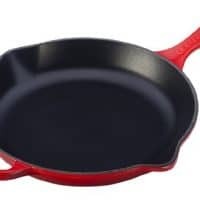 Toss pasta and 2 teaspoons oil in 12-inch broiler-safe skillet until pasta is evenly coated. Toast pasta over medium-high heat, stirring often, until browned and releases nutty aroma (pasta should be color of peanut butter), 6 to 10 minutes; transfer to bowl. Transfer skillet to oven and broil until surface of pasta is dry with crisped, browned spots, 5 to 7 minutes. Remove skillet from oven (skilled handle will be hot). Let cool for 5 minutes, then sprinkle with fennel fronds and serve with aioli. What an honor, to review their cookbook for them! This is a cool recipe, which I will be trying. Thanks! I was thrilled to be able to review their book! I’ve long been a fan of Cook’s Illustrated too. There is something to be said about well researched and reliable! As for this fideos, it looks so good! These are a lot of ingredients I use all the time too, especially the smoked paprika. I love that stuff. Smoked paprika is a magical ingredient–adds so much depth to a dish! It’s a great book. You should totally check it out! I love fideos, but haven’t made them in a long time. You’ve got so many healthy ingredients here, I definitely want to try your version. I do like a good successful easy meal that offers goodness and taste. One pan dishes can be a great way to create these kinds of meals, so the book is a fabulous idea. I’m a big fan of ATK, too – and I’ve had this book checked out from the library for a couple of months (keep renewing it)! I have so many things marked to make. This dish looks incredible – healthy and filling and I think I need to make it asap. I’ve been hearing a lot about fideos recently, but haven’t gotten a chance to try it yet. 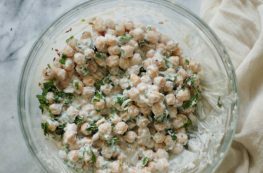 I love your version with chickpeas and kale– it looks delicious! Can’t wait to make this and finally try fideos! ATK I love it and Cook’s Illustrated. This looks simply divine! I love this recipe, Mary! It looks so delicious so it is definitely worth the effort!